Located in extreme western Colorado, the Unaweep Divide is a unique, paved cycling climb that is often overlooked. The pass never crests a ridgeline with far reaching views. It stays in a canyon, a mysterious canyon in which rivers seem to change direction. Of course they really don't. Instead one water way exits through a narrow red rock canyon, while another tumbles down from a high snowy plateau. This togographical puzzle has its origins in the geology of the Colorado Plateau. The canyon was carved by an ancestral river. Through uplift and stream capture it was relocated to today's Gunnison River, leaving this canyon high and dry except for runoff that took advantage of the already existing valley. This is one case where the canyon is much older than the course of the stream occupying it these days. From North. 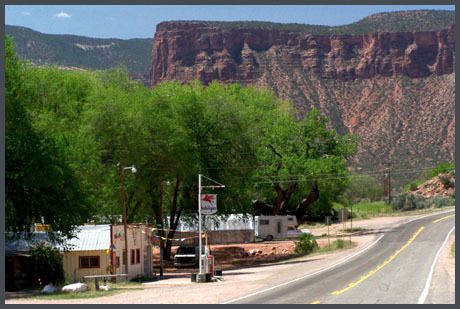 The climb starts at the junction of Co141 and US50 south east of Grand Junction. The thin flaky rock layers flanking the lower climb resemble a baked cherry turnover, while across the wide dessert valley carved by the Gunnsion River, puffy cream clouds billow over the giant bread loaf of Grand Mesa. The climb levels out after 8 miles. While the dirt surfaced "Divide Road" continues to climb further up the Uncompahgre Plateau, the road to the Unaweep Divide seeks out the canyon of West Creek. The straight high cliffs stand in contrast to the small meandering creek at its bottom. Thimble Rock near the summit is one of the rock formations deemed worthy as being labeled by a roadside sign. The divide itself is somewhat anticlimactic, hardly noticeable if it wasn't for a sign, and even that is only noticeable if traveling at a slow pace, like a bicycle. Private residences with large parcels of land are near the summit. From South. 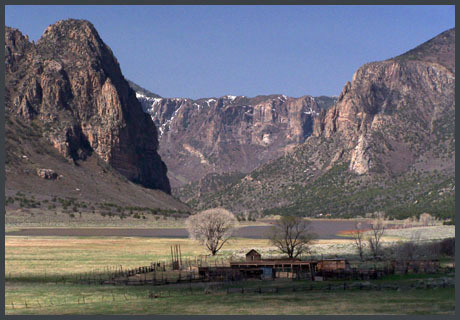 The canyon leading to the Unaweep Divide begins where Co141 enters the Uncompahgre Plateau in Uravan. But the climb begins many miles later in Gateway. The section between Uravan and Gateway is actually downhill on the average, even though a rolling valley bottom would describe the road better. The canyon follows the Dolores River downstream to Gateway, located inside the deepest part of a dark red canyon with sheer cliffs. Here the Dolores pulls an escape trick and exits the scene by escaping to terrain of further topographic confusion in Utah. Meanwhile the road, still inside the main canyon, now follows a tributary of the Dolores upstream, West Creek. As the road leaves climbs above Gateway, you can catch a glimpse of the La Sal Mountains, a contrast of often snow capped rounded mountains, behind sun baked vertical cliffs. Immediately thereafter, the road enters its own vertical canyon landscape, not nearly as red as the Gateway area. Still it is easy to forget that this not the state bordering Colorado to the west. The summit levels out very gradually amidst more moderate landscape.